(Left to right) Paulinho, Oscar, Talisca. Only in the past few years has China rose to prominence in the footballing world - mainly thanks to their outlandish spending on world-class players. 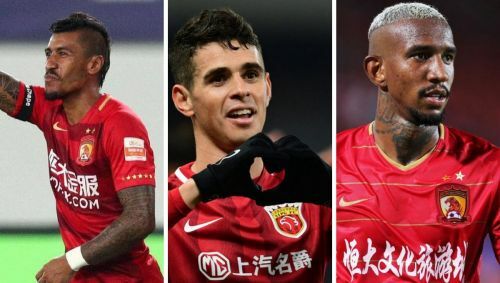 Like the MLS, the Chinese Super League has no real pedigree or prestige, therefore the only way to attract players is to offer them absurd wages-per-week; this is a lot more difficult for the former, however, as there is a cap on wages, whereas in China, just about anything goes. It's become quite controversial now for players to head to China to play football, as it reveals their true colours, following their greedy desires to be paid exorbitant wages, rather than focusing on achieving something worthwhile. Most recently, Marko Arnautovic has tried to force a move out of West Ham United, a Premier League club, to head to some obscure Chinese team; his agent (his brother) claims it's always been a dream for Arnautovic to play there, which is perhaps the most laughable excuse they could have put forth, but this shows that players are willing to risk their careers fading away for a short-term financial boost. With that being said, however, there are certainly some world-class players in the Chinese Super League right now, and in this list, we'll go through ten of the best currently competing with their respective sides for the title. 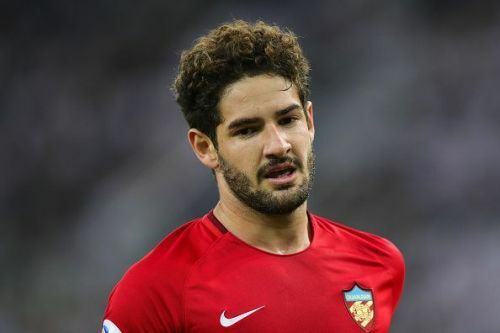 Alexandre Pato is a 29-year-old striker who plays for Tianjin Tianhai. He has also featured for Brazil's national team, having made 27 appearances since his debut back in March 2008. Pato rose to prominence after his move to AC Milan in the summer of 2007 for a fee of around £21m from Internacional. He remained in Italy for over five years, netting an impressive 51 goals in 89 appearances, before leaving to join Corinthians. This sparked the gradual decline of his career, as he spent the next two seasons out on loan; firstly with Sao Paulo, before then joining Chelsea. His time at Stamford Bridge was rather dismal and he spent more time on the bench than he did on the pitch, which is why he wasn't offered a permanent contract once his loan deal expired. He promptly joined Villarreal six days after returning from Chelsea, this time the move was permanent. Yet he was only with the Spanish side for six months before he joined Tianjin Tianhai, the club he's been with for the last two years, for around £16m. Pato is currently tearing up the Chinese Super League, scoring for the fun of it. He's on 15 goals in 23 matches, with three assists to his name. Could he be back in the top-tier of football one day?